Morinobu Endo reflects on his collaboration with Millie on carbon fibers. I would like to extend my wishes of a good afternoon to all the participants and everyone gathered here, today. 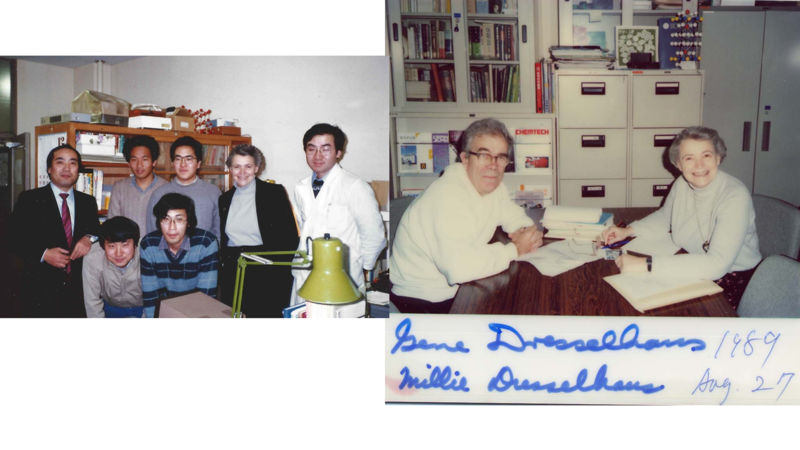 I would like to talk, for a short while, about the many years of collaboration that I’ve had with Professor Millie Dresselhaus. This photograph was taken when Tohoku University awarded an Honoris Causa Doctorate to Millie Dresselhaus. Professor Saito will speak more about this, later. 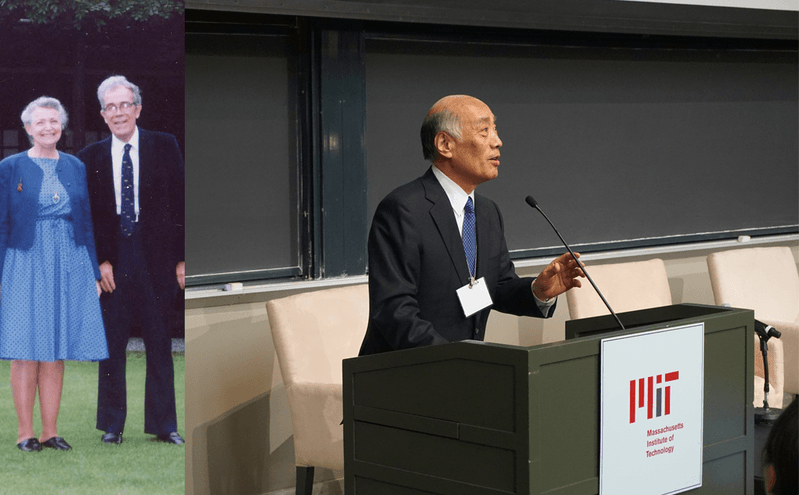 But you can see, here, that Millie is sitting in between Professor Date and Professor Kamimura — two good friends she’s had since researching graphite intercalation compounds in the 1980’s. This photo is poignant because all three of these professors were 85 years old when the photo was taken (which was 2016). I don’t know if that is true, but it was very flattering. 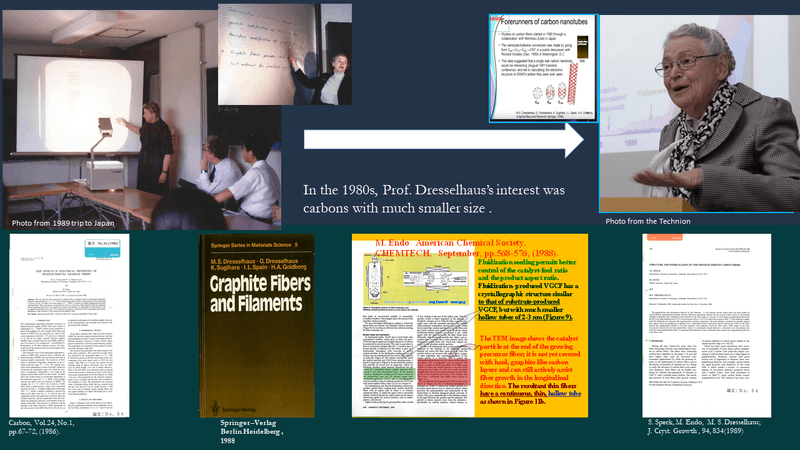 And I think she got a lot of basic information about graphite, graphene, and carbon nanotubes from her research on graphite intercalation compounds — that was even before the materials of graphene or carbon nanotubes were created. 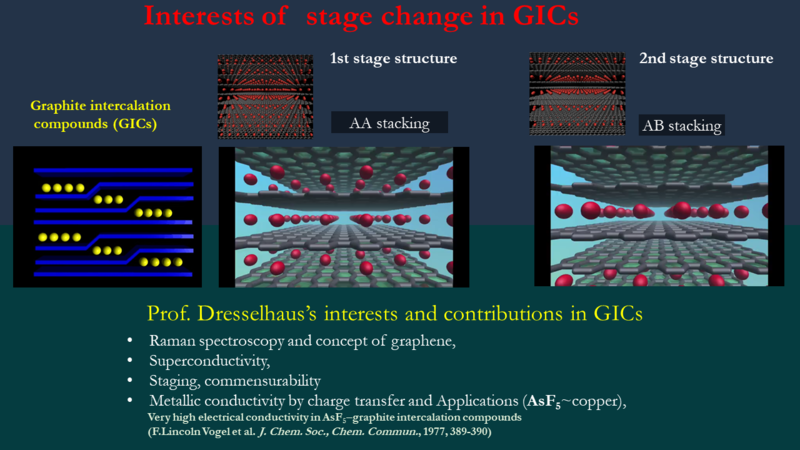 The slide above shows some of her research on intercalation compounds, and she was able to get very important information about graphene using those methods. 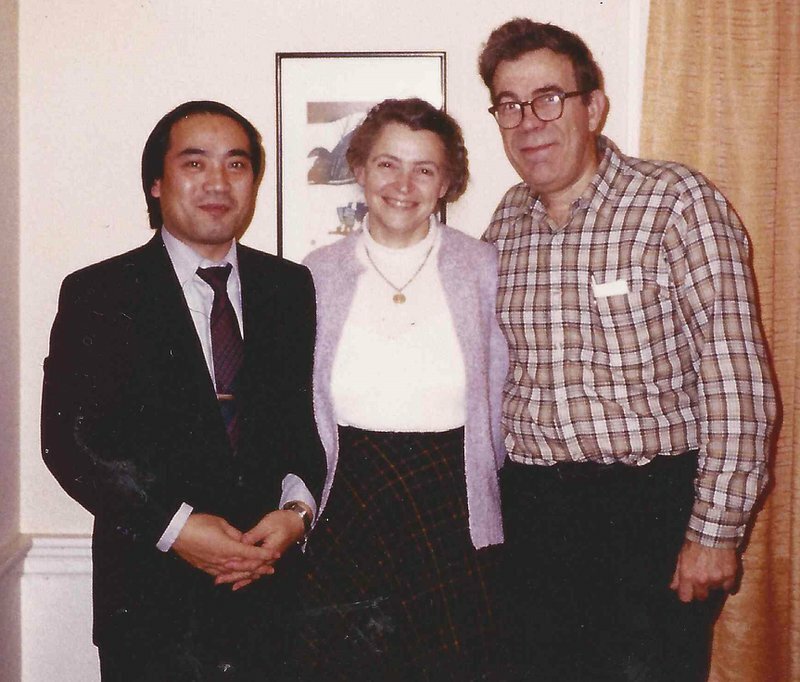 When she visited my lab in 1989, she was very interested in vapor growth carbon fibers. There was a photograph published in the New York Times newspaper in which Millie held the carbon fibers I sent her. The photo was published two separate times! Millie was very proud to show off the vapor growth carbon fibers in front of the New York Times journalists. 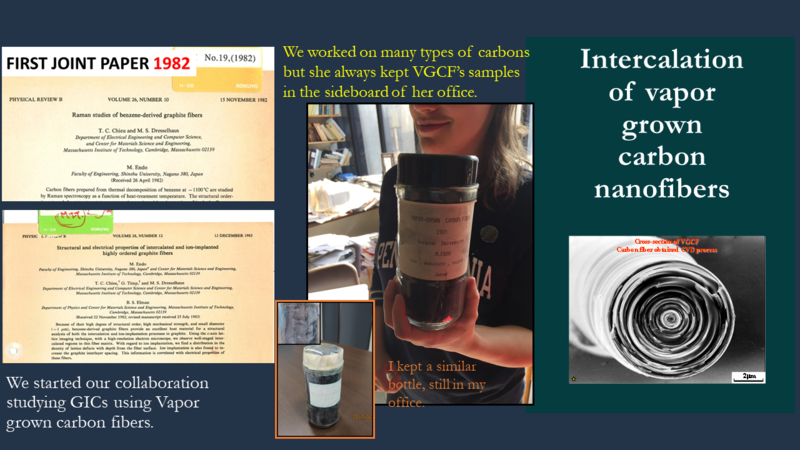 Unfortunately, when I sent her those samples, I sent them to her in an empty instant coffee bottle (jar). If I’d known she was going to pose for a newspaper photograph with it, I would have prepared a much more beautiful bottle for her! Anyways, back in 1989, Millie went to our lab and observed our furnace, which we used to do the vapor growth process and produce the vapor growth carbon fiber. This is abbreviated as VGCF’s. And now, that name is synonymous with carbon nanotubes that have much structure. At that point, her interests moved from 3D graphite intercalation compounds towards studying forms of graphite that are only 1 layer thick. And we published, with her, the much simpler carbon fiber, which can be developed into the concept of carbon nanotubes. And that, in turn, can be developed even further to get the concept of single-walled carbon nanotubes. Millie’s imaging techniques for carbon fibers were the same kind of thing as she used for single-walled carbon nanotubes. And she published those techniques, along with her interests on single-layered carbon, in this book: “Graphite Fiber and Filaments”. 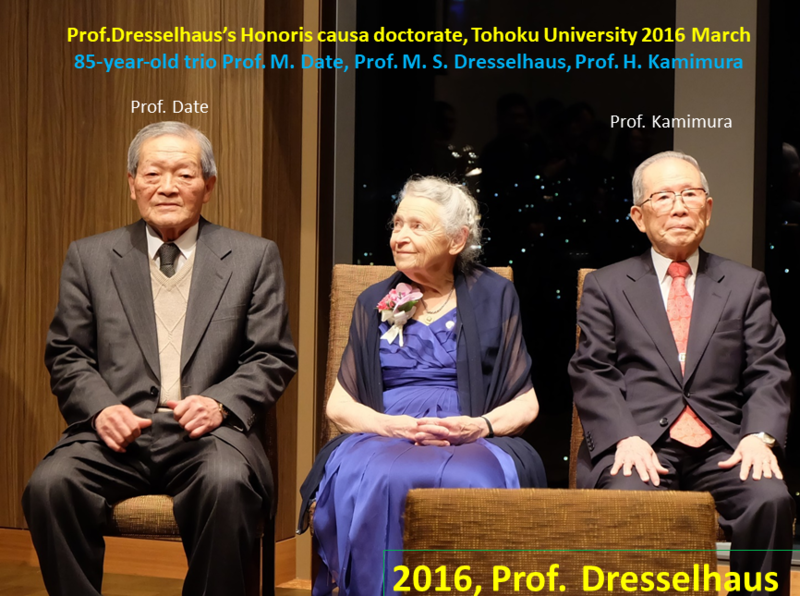 This photograph was taken at the Kavli prize. That's a very important message. And Millie-sensei, I hope that you can now continue to write your papers up in heaven. Please watch over Gene-sensei and your family, and all your beloved here on Earth. 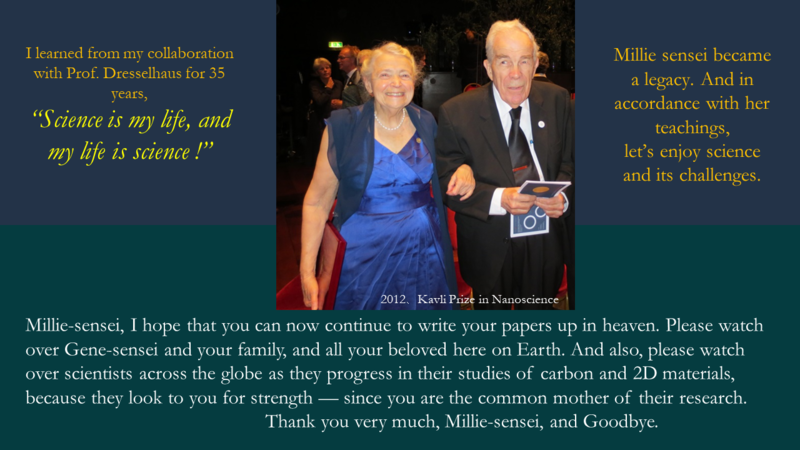 And also, please watch over scientists across the globe as they progress in their studies of carbon and 2D materials, because they look to you for strength — since you are the common mother of their research. Thank you, Millie-sensei, and goodbye.